These easy Smoothie Bowls are a quick breakfast or post-workout snack with no cooking required. 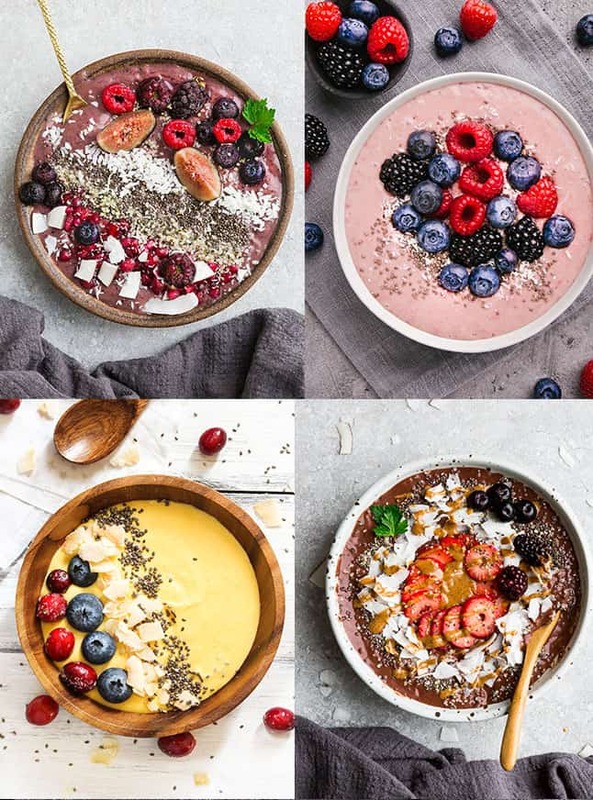 Low carb, dairy free, Whole30, paleo & sugar free smoothie bowl recipes that are full of protein! Looking for a healthy keto breakfast or quick-and-easy afternoon snack that doesn’t contain eggs? Smoothie bowls are perfect since they require no cooking and they’re packed with nutrients that will keep you energized all day long. A smoothie bowl is basically a thicker smoothie that you serve in a bowl instead of a glass. Instead of sipping it, you eat your smoothie with a spoon so it’s more like a meal. Plus, you get to pile it on with all your favorite toppings! Smoothie bowls are seriously one of the easiest things to make. Simply add all of your ingredients to a high-speed blender and blend until smooth. 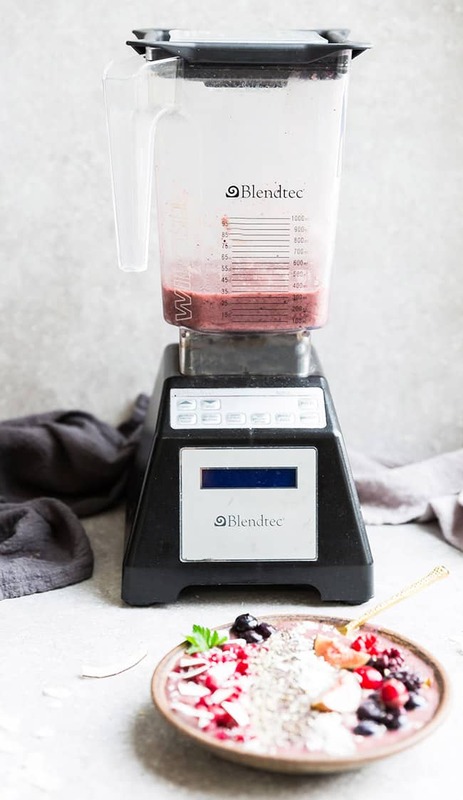 The important thing to remember is the order that you add your ingredients into the blender because of where the blade sits. The liquid on the bottom helps push everything up and down and is essential if you want the texture of your smoothie super thick and creamy. Start by adding the liquid to your blender – Water, almond milk or coconut milk. Next, add any soft vegetables – spinach, kale, collard greens etc. And finally, you add the frozen fruit. ARE SMOOTHIE BOWLS OKAY ON KETO? The thing to be careful of smoothie bowls is that many of them can be loaded with sugar and carbs. Typical green smoothies are sweetened with honey, bananas, maple syrup, kiwi and pineapples – all are higher in carbs and can spike your sugar levels if you are diabetic. The key to making keto smoothie bowls is to choose fruits and vegetables that are lower in carbs and lower on the glycemic index. WHICH FRUITS ARE LOW CARB? Raspberries, blueberries, strawberries and avocado are some of my favorites that I use for smoothies and are all lower in carbs. WHAT LOW CARB VEGETABLES TASTE THE BEST IN A SMOOTHIE BOWL? I like to add frozen cauliflower rice and spinach since they are low in carbs and very mild tasting. The cauliflower adds that creaminess that a higher carb banana would add except that it’s keto friendly. 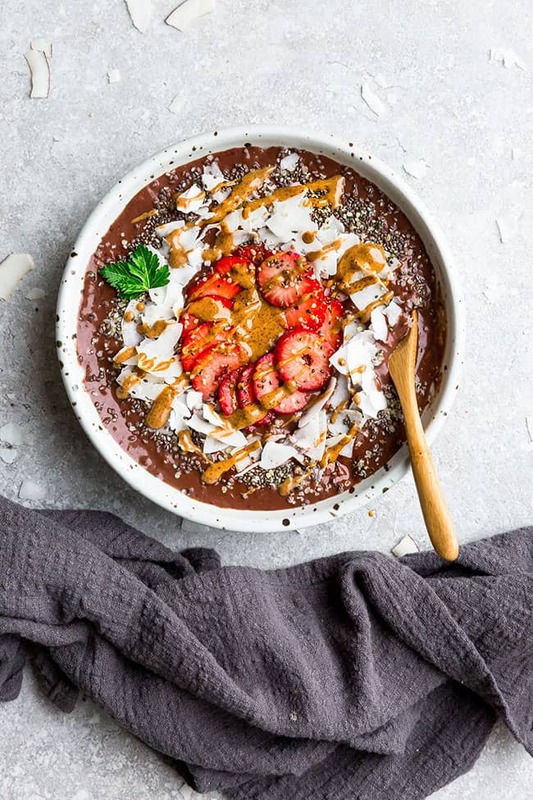 WHAT SWEETENERS CAN I ADD TO A LOW CARB SMOOTHIE BOWL? 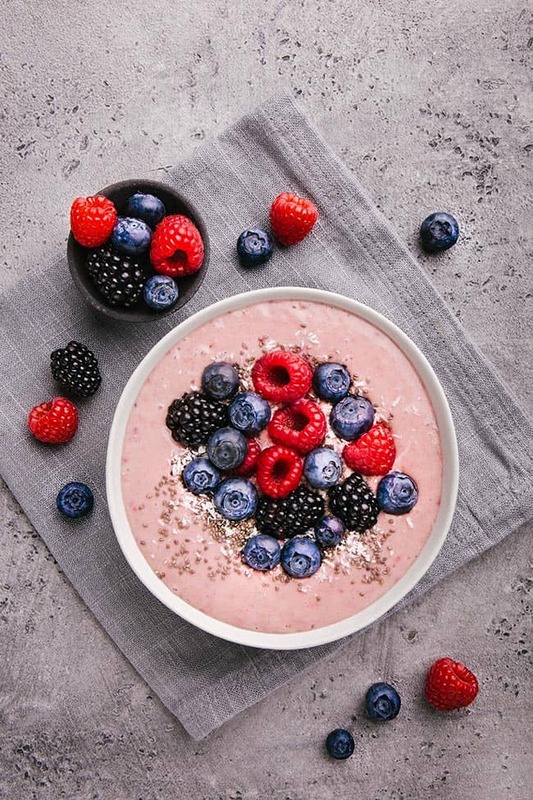 Low carb berries like raspberries and blueberries are often enough to sweeten my smoothie bowls. Plus, not adding any sweeteners keeps them Whole30 compliant. But if you’re looking to add a keto-friendly sweetener, my preferred sweetener is liquid monk fruit which is also paleo friendly as well. 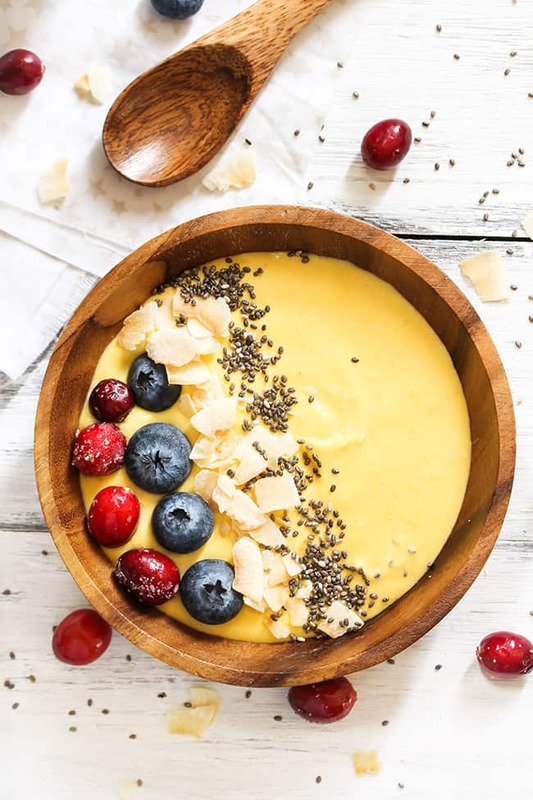 Depending on what you add, smoothie bowls can be enjoyed regularly as a healthy breakfast or snack. Low carb fruit and veggies are packed with vitamins and nutrients to help keep you energized. And of course, the best thing about smoothie bowls is definitely the toppings. You get the taste and texture of a smoothie, but with health-boosting, super-satisfying toppings. 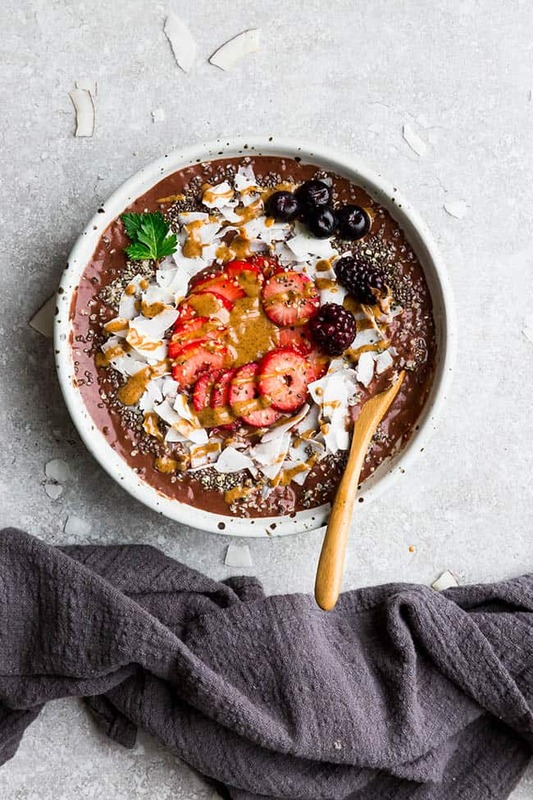 Many people like to top their smoothie bowls with granola, flaxseed, chia seeds, fresh berries, coconut, or even a little bit of dark chocolate to turn them into a heartier meal. 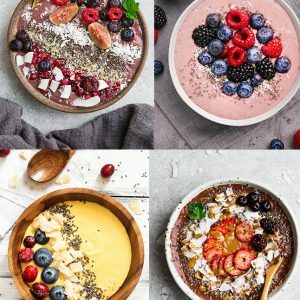 WHY MAKE A SMOOTHIE BOWL? Keto Smoothie Bowls - a quick and easy breakfast to start the day or post-workout snack with no cooking required. Low carb, dairy free, Whole30, paleo, sugar free and full of protein!